Tamara is stepping out in style in the Audrey Blouse in FIORE DELLA MATTINA & Roman Holiday Skirt in PAVONE/naturale. This Audrey Blouse, is made from a stunning embroidered cotton, features a classic collar and is tapered in at the waist to flatter you curves. It also has 3/4 sleeves with turned up cuffs, making it the perfect transeasonal blouse. 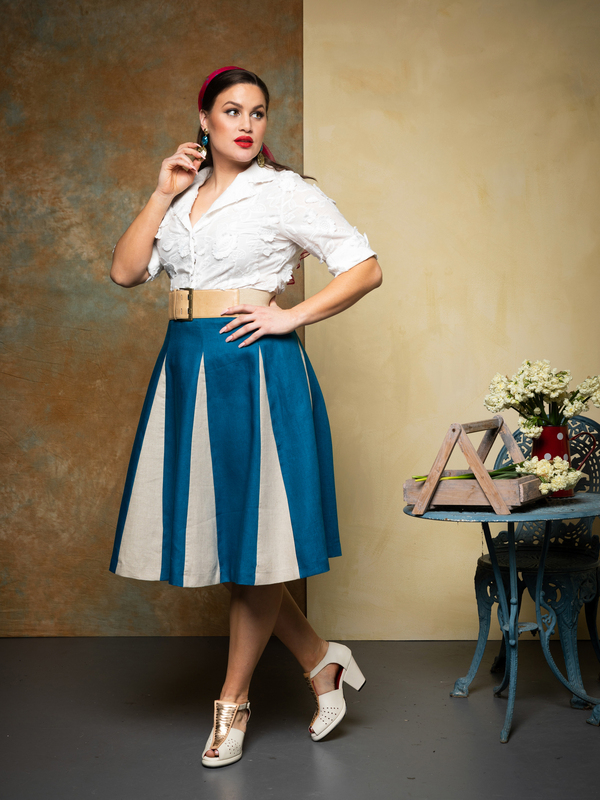 The fully linen Roman Holiday Skirt, made from a a fabulous mid weight linen, is fitted at the waist and flared from the hip with dramatic contrasting panels. This skirt is sold as a separate but team with the Sorrento Linen Jacket for a stylish Summer suit.